Iconographic Features: Traditional Harvester (Proulx 2007, 92) holding two bloody clubs of which bubble-like extrusions containing pollywogs emanate. Pepinos are attached to the body. Harvester depicted with hair hanks. Association with panels of rodents indicating fields and harvest. Iconographic Features: Traditional Harvester (Proulx 2007, 92) wearing a hairnet, a trademark for fishermen and warrior. It holds peppers/pepinos. Roots are attached to the elbows. Iconographic Features: Mythical Harvester with Emanations depicted with human body, human arms and legs, and bands emanating from the body. It holds peppers and wears a conical hat. Hat and legs stitched up the front. Bands filled with crops (peppers, maize, beans). 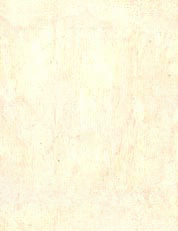 Human body depicted with jícima enclosed. Ears replaced by human arms. Description: vessel, ID number missing, M.N.A.A.H.-Lima. Iconographic Features: Late Effigy Harvester (Proulx 2007, 93) depicted with human body, human arms and legs. It holds peppers and wears a conical hat and a collar made of pepinos. Maize attached to the hat. Arms depicted with yam beans enclosed. Snakelike streamer emerges from the mouth, terminating in a feline head which in turn bifurcates into two branches, each containing warriors with clubs and in turn terminating in human heads. Bubble-like extrusions filled with birds emerge from the human heads. Spotted facial painting, eye-markings in the shape of maize. Corn cobs replaced by trophy heads. Description: effigy vessel, C-59471, M.N.A.A.H.-Lima. Iconographic Features: Late Effigy Harvester (Proulx 2007, 93) depicted with human body, human arms and legs. It holds maize and wears a conical hat and a collar made of pepinos. Maize and pepinos attached to the hat. Snakelike streamer emerges from the mouth, terminating in a feline head which in turn bifurcates into two branches, each containing warriors with clubs. Spotted facial painting, eye-markings in the shape of maize. Corn cobs replaced by trophy heads. Description: effigy vessel, C-04807, M.N.A.A.H.-Lima. Iconographic Features: Late Effigy Harvester (Proulx 2007, 93) (?) depicted with human body and human arms. Its body is covered with crops (lúcuma, pepino, pepper, yam bean). It wears a collar made of beans. Same type of headdress as CL 61. Iconographic Features: Late Effigy Harvester (Proulx 2007, 93) depicted with human body and human arms. It holds lúcumas and maize. Shoulders are replaced by corn cobs. It wears a collar made of peppers and lúcumas and a conical hat covered with beans. It is surrounded by Traditional Harvester Impersonators, some of them depicted in seated position. Description: effigy vessel, C-05025, M.N.A.A.H.-Lima. Iconographic Features: Late Effigy Harvester (Proulx 2007, 93) (?) depicted with human body, arms and human legs. It sits and holds roots (? ), and wears a balloon-like hat, a trademark of Wari noblemen. Facial painting shows eye-markings in the shape of bird heads. Arms depicted with twisted serpents enclosed. Collar is made of small serpents and peppers. Hat is decorated with pepinos. Snakelike streamer (= extended tongue) emerges from the mouth, terminating in a feline head which in turn bifurcates into two branches, each containing processions of (dead?) warriors with clubs. Between the legs a procession of four (dead?) men appears. Harvester surrounded by maize. Iconographic Features: Seated Anthropomorphic Mythical Being depicted with human body, snake arms and snake legs. It holds Feline Man (left) and a warrior (right) upholding a carrying cord. 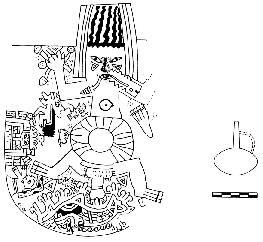 Spherical headdress shows Spotted Cat eating maize. Shoulders with modeled columnar cacti (San Pedro cacti?). Snakelike streamer (= extended tongue) emerges from the mouth, terminating in a feline head which in turn bifurcates into two serpents, the left one terminating in BMB-4, the right one terminating in Feline Hawk. Description: collared jar, ID number missing, M.N.A.A.H.-Lima. 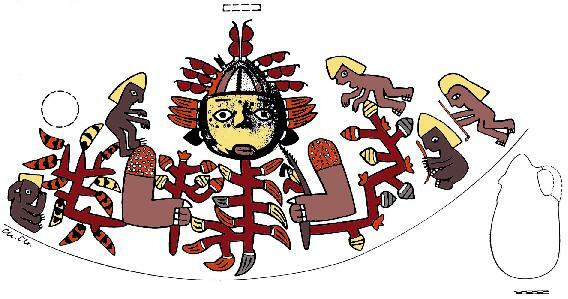 Iconographic Features: Unusual Mythical Harvester (Proulx 2007, 93) wearing a conical hat decorated with peppers, a Spondylus shell necklace, a collar made of pepinos (? ), and a tunic that is decorated with sweet potatoes (?). Its eyes are depicted with "tentacles" of a (catfish?). Ears replaced by lúcumas. Beans are attached to the hat. Two snakelike streamers (feline serpents) emanate from the body. They are depicted with fishes enclosed, and with pepinos(?) which are attached to the border of the serpent body. The Mythical Harvester is surrounded by herons, frogs, corn cobs, sweet potatoes and Traditional Harvester Impersonators who hold jícimas. At the right appearing Horrible Bird, Harpy and Feline Hawk as well as two foxes and a snake. Frogs, herons and a double headed serpent indicate a swampy area. Corn cobs indicate fields with crops. Two leaves (of a tree?) at the bottom left. Description: bottle, ID number missing, Museo Larco Herrera, Lima. Iconographic Features: an unusual Nasca 7 bottle with a ritual scene. A naked man lies on its back surrounded by the Killer Whale Mythical Being and animals (fox, mice, birds). To his right a woman and a Rayed Face with trident crown and seven (banded) arms/paws is shown. To his left a panpipe appears. The man holds a couple of rattles, a rattle and a fish are placed in his mouth. A similar scene was published by Tello (1959, pl. 90). 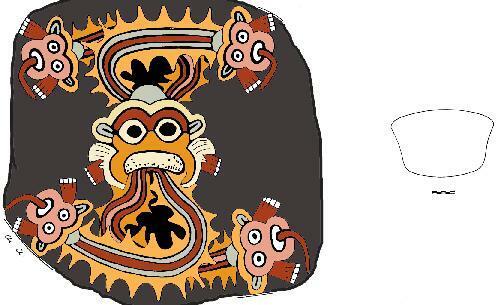 Iconographic Features: Wari Stinger Animal depicted with Bloody Mouth head type, animal forelegs and human legs. A stinger/tail is attached to the loincloth. Description: bottle, C-12075 (detail, handle), M.N.A.A.H.-Lima. Iconographic Features: Wari Stinger Animal depicted with feline head, human body and a stinger/tail that is attached to the human body. It holds a trophy head with both hands while the tip of its extended tongue is touching the head (trophy-head taster format). A One-Eyed Rayed Face is attached to the stinger. Iconographic Features: Feline Head with Snake Rays depicted with feline head, two paws and two jagged serpents terminating in feline heads. Two snakelike streamers emerge from the mouth. Black painted background may indicate the night. The painting is very exceptional because of its use of colours in combination with the artistic convention of overlapping: dark and light orange are used to emphasise the illusion of space. Interpretation as celestial body.